We had an excellent turn-out - saw some faces we hadn't seen in awhile as well as some new folks! Once the BS stopped and work commenced, here are the projects I know about! Team Vehicles - Al will provide a more detailed report, I'm sure, but I believe TV set about restoring fluids to the T's as they had been drained in preparation for the freezing weather. I believe one or two vehicles were started. Roger asked for an engine swap and I think the team started that process. That probably accounts for the fact that Lynn seemed to disappear for much of the day! Same for John Bush! Doug went back to work on the Indian, and Greg eventually ended up in the machine shop manufacturing a new brass cap for the bike. Al showed off his faux Indian racer and several guys worked on it for awhile. I remember a lot more volunteers than Tom has listed, of course Team Vehicles gets all the glamour...(blush) :-) and the volunteers working the vehicles got noted but not the guys who today, at least, did some much needed grunt work. I believe the folks present were: Tom G, Roger and Steve F, Jeremy, Duncan, Doug Horvet, the Miller boys Tom and Dave, John Bush, Lynn, Terry, Ron, Greg, Richard Smith, Richard Johnson, Rod, Carl, John V, Greg Solberg, Billy Cheshire, Jeff Jackson, Dave Orloff, Dave Edgerly, Roger Ritter, that totals 26, a good turnout. Actually the day started out a bit nasty, but rapidly improved except for the river running down the road and into the field, salmon were seen leaping but fortunately no bears. Well by later PM that runoff was dissipating and the field was beginning to dry a bit. It was like the mud of Flanders. Starting out it was pretty bad, but ways were found to compensate - the mud just slowed everything down. As for team vehicles, Tom touched on most of the activity. 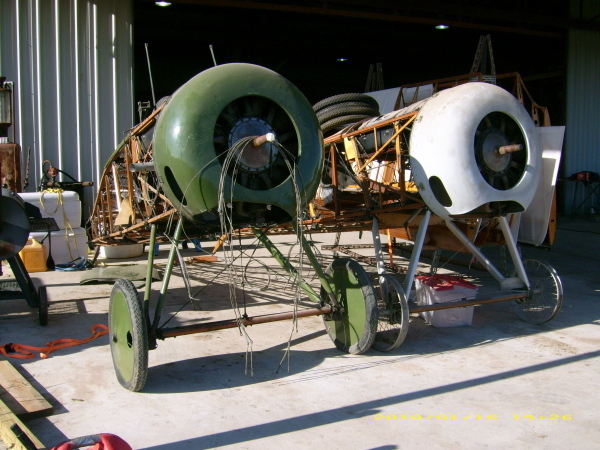 Lynn and John were actually working on various things in the old hangar, including loosening the engine on the US ambulance, running the signal corps truck, checking various things, to some extent a retrenchment after the doldrums of the past few months. It was great watching the Triumph putter around. Duncan and Jeremy first fixed the broken cable, using a chinese part from my second faux motorcycle engine to permanently secure the cable of this British bike (this helps keep this effort international). After fixing that, they began a laborious starting attempt, that took considerable physical effort on their part as the Triumph needs a very precise adjustment of levers to start...but they figured it out and the Triumph came alive. There is no question that we will need a volunteer in a Brit or US WWI uniform (I have the hat) displaying this bike. I have one WWI uniform that might fit someone. Next on the agenda for the Triumph is tightening the drive belt. Duncan shot this video of Jeremy starting and running the Triumph. 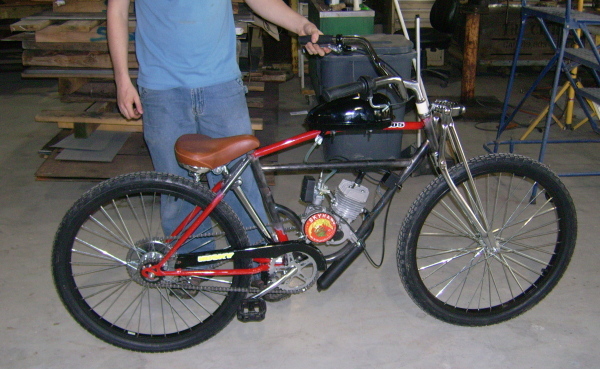 As you can see, it's as much a portable smoke-screen generator as it is a dispatch bike! Doug and Greg continued to chip away at the Indian. They did a REALLY smart thing which should help a lot - funny how even little things can have an impact. They removed the tub for the sidecar. 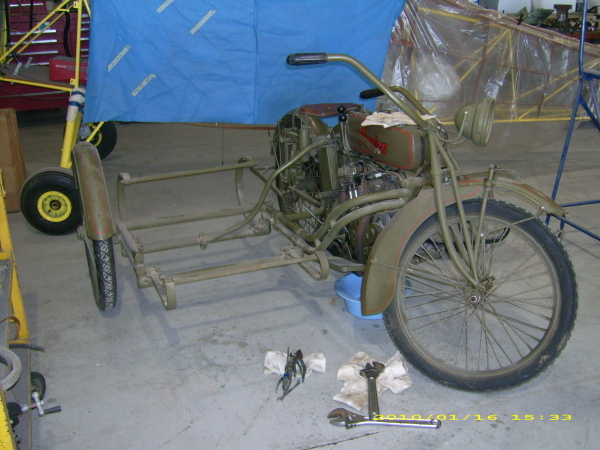 Now the needed work on the left of the bike can be done in a significantly easier manner, and the sidecar frame makes a great seat for working. Hopefully the field will be more dried out. Tons of things to do and the lion's share of moving stuff is almost over. As for the little faux motorcycle project, some of the guys took just a little time to do some weaking putting on the aftermarket springer front fork, which looks surprisingly like the antique Triumph fork, just a bit smaller. The temporary fuel tank was bolted on and Jeremy and I late in the day gave it a try. It started but only ran about twenty feet before the chain came off. This was semi-anticipated as a potential problem, so I am getting the chain shortened a bit and will try again soon. For the few seconds it was running it was very cool, quite a rush with the seat down so back and low. Side by side with the Triumph it looks like a slightly smaller version.